We had a great time at Shuffle Festival last year and were excited to be invited back again with a screening of Nature's Switch to a live performance of a new score composed by original composer Louie O'Grady and collaborator, Ody Constantinou. The festival took place over 24 hours and year's theme was God's, Idols and Light, so our film was perfect for the programme. As the sun set, Nature's Switch was performed and again in the early hours of the night. 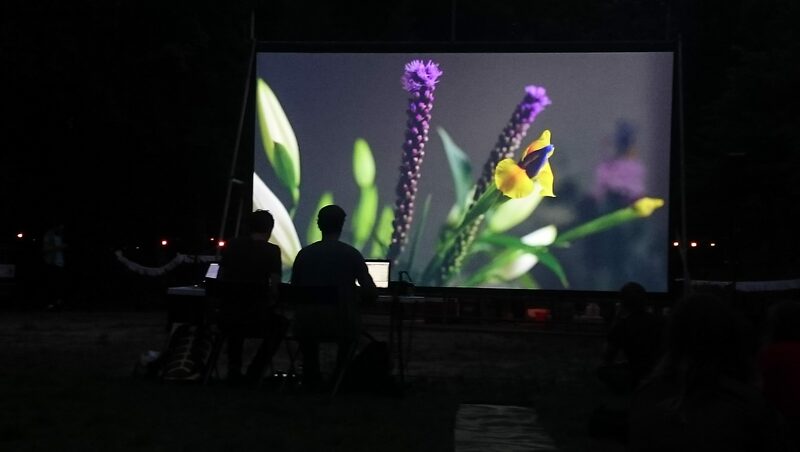 We had a great time at Shuffle Festival last year and were excited to be invited back again with a screening of Nature’s Switch to a live performance of a new score composed by original composer Louie O’Grady and collaborator, Ody Constantinou. The festival took place over 24 hours and year’s theme was God’s, Idols and Light, so our film was perfect for the programme. As the sun set, Nature’s Switch was performed and again in the early hours of the night. Shuffle was totally chilled. As the festival crew set up, breakfast was served and audiences welcomed in – a mix of artists, local residents and art lovers spilling in gradually to a cemetery in a forest clearing in the East End. We are incredibly grateful to Rosie and Emily at Wellcome Collection who originally commissioned the film and who supported us to develop the live score, which gave the composers studio time to experiment, in Berlin, where Ody is based. Massive thanks also to Kate, Director of Shuffle who made us really welcome and secured Arts Council England funding to support the performances. Plus, some good news, Nature’s Switch was selected from 550 films submitted from 35 countries to be long listed for the Lumen Prize. The longlist was announced in London on 13 July at the Electronic Visualisation and the Arts Conference. The jury are Douglas Dodds, Senior Curator at the Victoria & Albert Museum, WeiWei Wang, Museum of Contemporary Art (MoCA) Shanghai Curator, Tessa Jackson, UK based Gallery Director, Bruce Wands, Artist and author and Canadian filmmaker, Michael Fukushima. The public can also vote via the People’s Choice Award. For a limited period, the public can view the films, including Nature’s Switch, and register to vote for any of the long listed films for the People’s Choice Award in the Online Gallery. Nature’s Switch can be viewed here. The winners are announced on 29 September 2016 at the Lumen Winners’ Gala at Hackney House, London. All shortlisted work will be presented in the fifth global Lumen Prize exhibition tour, which travels from Shanghai to New York City to London, Leeds and Caerphilly.